JC Decaux have released an official API that can be used to query the Dublin Bikes scheme as well as other schemes they manage, e.g. Dublin Bikes in Dublin (Ireland) & Cyclocity in Vilnius (Lithuania). $api = "API KEY GOES HERE"
$response = invoke-jcdclient -url "$($contractsURL)?apiKey=$($apiKey)"
$response = invoke-jcdclient -url "$($stationsURL)?contract=$($contract)&apiKey=$($apiKey)"
$response = invoke-jcdclient -url "$($stationsURL)/$($number)?contract=$($contract)&apiKey=$($apiKey)"
Unfortunately this method isn't working on a certified device. Won't boot past the BDE PIN entry screen. Have got it to work in VirtualBox though. Will try and blog this when I get a chance. An initial test boot brings you to the Windows loading screen but fails to boot with a nice new BSOD. It won't hang around long but I was lucky enough to make out "INACCESSIBLE_BOOT_DEVICE" before the machine rebooted. 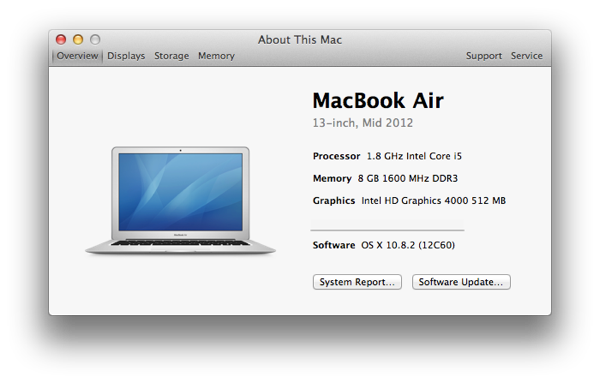 I decided to try and hunt down drivers for the MacBook Air's hardware for Windows. The easiest source of these is the Boot Camp Assistant in Mac OS X. 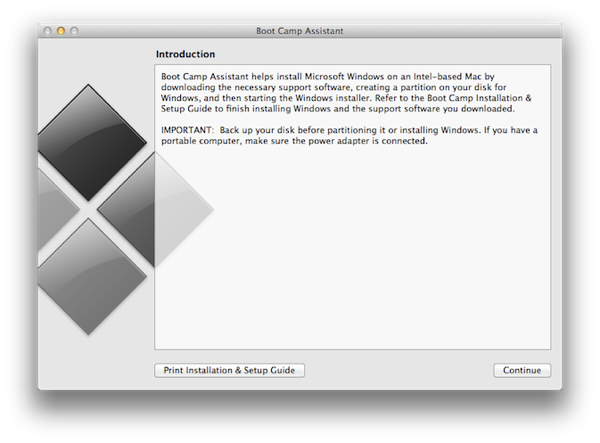 For those of you who don't know, Boot Camp Assistant is designed to help create an alternate partition on your Mac where you can run a Windows environment natively by selecting it at boot. This does this by non-destructively partitioning the disk and then providing the user with a ISO image or a burned CD containing all the relevant drivers to get Windows up and running on Apple hardware. How convenient! 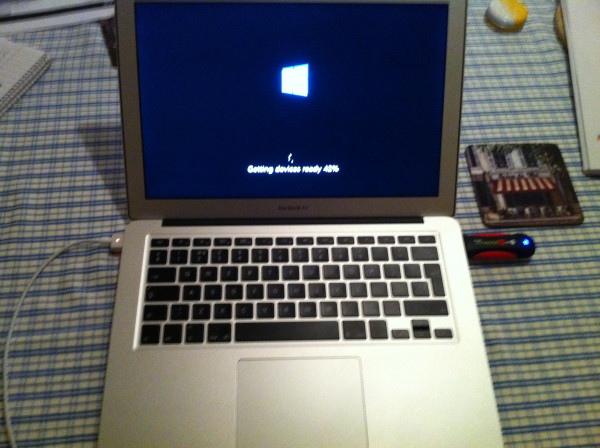 The next screen in the Boot Camp Assistant allows you to "Download the latest Windows Support software from Apple". This is the option we want! I chose the first option. 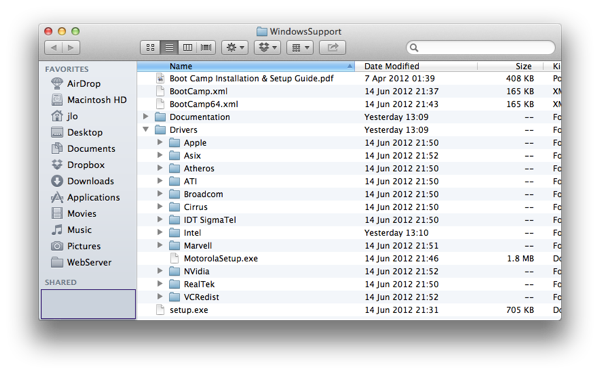 As I don't have a CD/DVD burner this created a folder called "WindowsSupport" that contains all driver files required. This command should inject all of the drivers present in the Boot Camp generated support file into the WTG media, in my case, 161 drivers were loaded. When complete, remove the driver and test boot into the Apple! Now that the USB 3.0 controller driver is loaded in it can finally contact the boot device and load the OS. Occasionally when booting I got a BSOD but this seemed to disappear on the second boot attempt. Migrated to Office 365? Running low on licenses and want to do a review of existing license assignments? In work, we recently had to do a reclamation of licenses from users who had left the company but had somehow managed to retain their licensing status in Office 365. Behold the results! Make sure you change the UPN value being queried below as I'd be surprised if ye're using DOMAIN.COM! All comments and suggestions on improvements are welcome. I'm relatively new to Powershell. I got a bit lazy when it came to cleaning out my downloads folder. Old .DMG files, installer files and other detritus were bloating my Download folder so that the stack view in my Dock was becoming a pain to use. I decided to adopt a bash script we run in the office at home to aid me in my quest for a tidy Downloads folder! By leveraging the find command in bash, a user can create a script that can find any files in a directory that match certain criteria, e.g. type, file name and date created/modified. In my case, once found, the files will be deleted. Instead of using -mtime to determine age, you can also use -atime or -ctime. I'll leave it up to yourselves to read about that though! For a downloads folder and maybe for different file types, -atime may be more appropriate for some of you. However, since I'm dealing with installer files, -mtime will suffice! Once the script has been created, apply to your user crontab at whatever interval you so desire! #       Delete files older than 21 days in Downloads. echo "Deleting (M)PKG, DMG and ZIP files that are older than 21 days in Downloads." I recently changed to Three.ie as my mobile broadband provider. They provide a nice handy way of checking remaining monthly data allowance via their "my3.three.ie" service. Signing in is handled automatically on their side based on the network you're using. Handy! Since I've been messing around with Ruby a bit I figured I'd try and make a ruby script that would check my remaining data for me! My efforts are below! Please comment on any improvements that you think I can make. Especially relating to the instance vs. class variables! I use this script in combination with a bash script to display data on my desktop using GeekTool. The bash script attempts to ping the mobile gateway's IP address. If it is available, the ruby script is executed. Simples! puts "3 Mobile Broadband Pro"
During the actual configuration of the Cisco 877s 2 weeks ago some issues arose which needed some debugging! All commands shown below were entered via global configuration mode. Initially we had some issues with DNS lookups and connections to SSL secured services like HTTP and IMAPS. It turned out that I had failed to alter the MTU values! I didn't actually think that I had to! My bad! The internal VLAN interfaces needed their maximum segment size (MSS) values adjusted to compensate for the 8 extra bytes needed by the PPPoE header. The GRE tunnel interfaces also needed some adjustment. This presented as being unable to access services on the other end of the VPN. Again, the MSS values needed to be lowered to account for the GRE header and IPsec headers. There was also some issues getting DSL sync and proper downstream/upstream speeds. Initially, with the ATM interface set to automatic, it was only getting 7meg down. To achieve the full speed I set the DSL operating mode explicitly to ADSL2+. Still no joy though! I lost DSL sync. This was countered by setting the DSL sync mode to ANSI on the ATM interface. Once that was done, the DSL sync'd and proper speeds were achieved. Below are the commands used on the interface. I decided to finally go ahead and get some Cisco gear! To start off nice and easy, I elected to get some devices that would prove useful at home. To that end, I decided to get two Cisco 870 Series Integrated Services Routers. These would allow for me to experiment more with IOS out of college as well as providing some more security related services for Dad. Namely, a site-to-site VPN linking home with the office. So at 14:30 today (3/2/11) the IPv4 unicast address space was declared fully depleted. ARIN (@TeamARIN), the body in charge of US Internet regulation released the blog post linked below. Their post links to the summary of the event that occurred earlier today. It also contains links for an IPv6 specific wiki. My attempt at a #nowplaying app for Mac OS X! As part of my placement, we monitor websites hosted by Blacknight.ie. If Blacknight are having issues we tend to get alerts messages about "Connection Refused" which tend to cause some consternation! To cut down on the amount of clicking, I've wrote a small bash script that can be run by OpsView/Nagios that will check the Blacknight Status Page and return a count of the number of times that the "NOTOK" image is shown! If that number is more than one, Blacknight's servers are reporting problems! This weekend a problem arose with the OS X Server back home. I initially noticed it when I couldn't gain SSH access to the machine. Using verbose output the SSH connection would reach the status of "entering interactive session" but would proceed no further. When a user attempted to log on locally to the machine, even though the password and username were correct it would still display a logon failed message. Using the local administrative account I determined that slapd wasn't starting up. This week I took delivery of a Novatel 2352 MiFi device. MiFi is a concept whereby a mobile broadband connection is shared to a limited number of clients via 802.11 wireless technology. Here's my experience so far! Recently I met some people who said that Computer Services was unable to help them get their Mac OS X computers onto the student WiFi network in IT Sligo. Anyhow, here's a PDF I've thrown together to instruct a user in how to do it. Leave me a comment if you need any help or more information. Click here to download/view the PDF! Checking your IT Sligo Studentmail whilst avoiding webmail! Recent changes to IT Sligo's mail setup has made this guide obsolete. Tired of using webmail to check your IT Sligo Studentmail? I know I am. Ideally they'd upgrade to Exchange 2007 and give us all nice access to our mail AND the college global address list. I think that sounds like it makes too much sense though. For now, you have to be content with IMAP/POP access. If this sounds interesting to you read more!! Occasionally some of my friends contact me asking for assistance with their Macs. Usually this help can be conveyed over the phone, but sometimes I couldn't be bothered trying to explain it all, I just do it myself! How, you might ask, can I accomplish this when my friends are 2 hours away! Use SSH as a replacement to "Back to my Mac"
If you're like me and you find that MobileMe's "Back to my Mac" feature never works, don't fret! SSH can be used as an alternative. Currently I'm working on an app that, like many, borrows its data from a 3rd party. In my case, I'm parsing the HTML from a website. I had such parsing working from within the app itself using TFHpple, an XPath parser. However this meant that the iPhone would be doing all the work. Also, if the site that I'm scraping ever changed it's layout, my app would immediately stop working and my app would be out of action for at least 10 days! To that end, on the recommendation of many fine XCakers, I began into coding a middle-man script. This script would be passed an identifer and would then go and parse the HTML generated by using that identifier. It would then return the wanted data in the form of a JSON string. Last week I attended iPhone App School in the Castleknock Hotel in Dublin. This course is one of many courses offered by SQT Training Ltd. in Limerick and was organised by Daniel Heffernan, Patrick Collison and Damien Mulley.